London Stansted Airp.. (STN) ↔ Ebbsfleet Internatio..
London Stansted Airp.. (STN) ↔ Darfort Ebbstfleet R..
London Stansted Airp.. (STN) ↔ Southampton Cruise P.. When visiting London Stansted Airport, you can book a per-hour car rental with driver from 2 hours/day and more. Meet and Greet service, offered by our company, will significantly simplify the meeting in the airport for the newcomers. Using a "car rental with driver" service you can vesit the places of interest, famous shops or outlets to do some shopping near the city, saving your time in this way. London Stansted Airport chauffeur service offered by our company will cost you much cheaper to order a car rental with driver with us than to hire a taxi driver. To book the economy car or minivan with chauffeur or a comfortable premium class car, coach, shuttle bus up to 50 seats, please choose the button. Per hour rental in the left upper corner of the page, write in the [Departure:] field the departure point and number of hours. 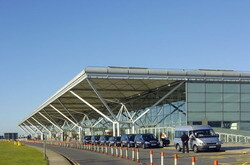 London Stansted Airport STN is 48 km away to the north-east from the city center. There is a railway station just neaby the airport terminal, from which you can easily get to the central and the eastern part of the city by train spending about half an our on your trip. You can reach the city from the bus station - there are different bus routes that lead to different areas. It will surely be interested for those who want to save money. However, the fact that the bus is cheaper than a taxi is the only one advantage of this mode of transport, while you have to spend a lot of time waiting for the bus on the way and to endure the inconveniences in crowded buses. If you want to get to your destination quickly, comfortably and cheaply, please book a transfer service from Stansted Airport to the city from our company and be sure that you will be satisfied with your choice. We are looking forward to receiving your orders!.